The rise and fall of Easter Island is a classic study of climate change, overexploitation of resources, and conflict. Discovered by Polynesian explorers at the end of the Holocene warming period due to a shift in winds, the island's population was the most isolated in the world.The early generations were blessed with fertile soil, though the islanders' high birth rates and cultural practices quickly stressed the environmental fabric of the island. By around AD 1400, the population had reached approximately 10,000, too high for the available resources to support. A coup began a series of civil wars, and by the 18th century when the first Europeans arrived, the surviving populace hovered around 2,000 due to starvation, civil war, and an inability to flee the island. Although the indigenous inhabitants of Easter Island left no written history, archeologists believe around 100 inhabitants arrived in the 5th century AD from what would become the French Polynesian islands. 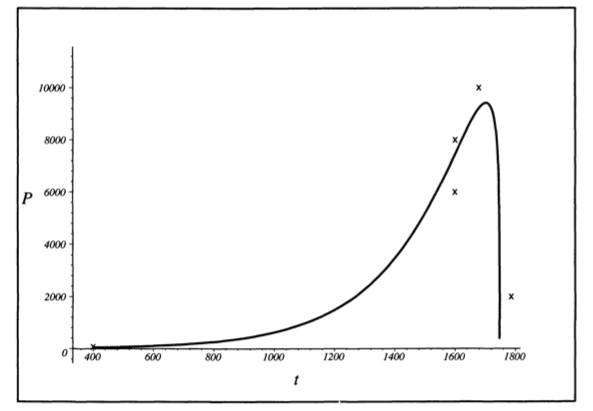 The population grew slowly until around AD 1100, when its size doubled every century until the 15th century. By 1680, the Rapa Nui population may have reached 10,000 people. By the mid 1800s, the number of indigenous Rapa Nui had dropped to around 2,000. According to the oral history of the Rapa Nui, the population of Easter Island contained ten clans or "mata", which fell roughly into the Kotuu and Hotu-iti groups identifying with the Western and Eastern parts of the island, respectively. These two groups were political rivals, leading to a series of conflicts. Each year, the clans would compete for ruling power over all the other groups as directed by the dictates of their religion, known as the Bird Cult, determined by a race to a nearby island in hopes of reaching the first laid egg of a certain migratory bird. Victory celebrations supposedly condoned the raiding of the losing group's crops, homes, and stored resources, as well as a certain amount of canibalism. The winner of the race was known as the Bird Man, and held power for only a year, leading to a society that rejected sustainable agricultural practices in favor of short-term wealth acquisition. The first recorded European contact with the Islanders was in 1772 when the Dutch admiral Jacob Roggeveen sighted it on Easter Sunday. Heavy resource competition, along with Peruvian slave trading and disease nearly wiped out the entire population by the 19th century. In 1852 Chile annexed the island, and it remains a territory to this day. Although the archeologists and historians disagree on when the first Polynesians discovered Easter Island, most agree that it occurred around the time of the Medieval Warming Period, an era characterized by an important shift in the Pacific trade winds. Instead of the prevailing northeasterly and southeasterly trade winds common during Southern Hemisphere winters, westerlies facilitated travel east during the summer, normally upwind and therefore out of comfortable sailing reach. Because the Medieval Warm Period brought higher temperatures to the tropical Pacific, the area would have experienced a higher frequency of El Niño events. El Niño events are more likely to weaken the Walker circulation, which creates the trade winds; therefore, the westerlies occurred more often and lasted longer during this period, allowing for previously unattainable voyages east. Two of the most striking features of Easter Island are its almost complete lack of trees and its giant stone heads, known as Moai; these two are more connected than one might think. When the Polynesians first landed on the island, nearly its entire surface was covered in giant trees, known as Paschalococos disperta, or Easter Island/Rapa Nui Palm. Botantists estimate the Easter Island Palm may have stood over 80 feet high and six feet in diameter. Several theories exist as to why the last pollen specimens for the palm date no later than 1450, the most popular of which is that they were cut down to act as rolling platforms with which to move the Moai , stone figures between 20 and 80 feet high depicting the heads of clans, from the quarries to their places along the shoreline. Other trees were cut to create paths for the Moai transportation. Other theories conclude that the palms were too delicate to support the massive weight of these figures and were instead cut down for their edible palm hearts or that a need for additional fertile soil as the population grew necessitated deforestation of large swaths of land. By the time James Cook landed on the island in 1774, he noted that no trees above ten feet tall remained standing. It may be that more than one of these theories are correct. 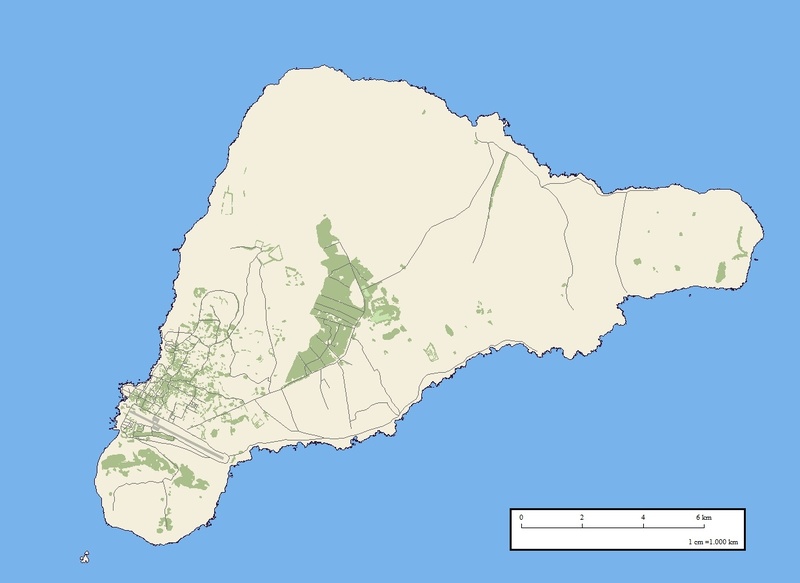 The green areas on this map of the island depict the current forested regions. Almost six centuries after the Easter Island palm became extinct, the island is barely beginning to recover. By the 17th century, Easter Island's population had topped 10,000, and competition for resources, historically possessing violent undertones through the winner-take-all mindset of the Bird Cult. The Easter Island palm had long been extinct, and soil erosion and rats had destroyed much of the arable land. Along with the loss of the palm came the inability to create vessels capable of carrying fishermen off shore in order to tap into that lucrative source of food; the islanders were stranded. Edible bird and wild fruit species began to die off, and the resulting losses increased the need for additional farming. Further compounding the problem of food shortages was the preoccupation with carving and transporting Moai; some scholars estimate that this energy expenditure may have required up to 25% more sustenance than normal. The situation finally reached a breaking point as the Bird Cult system and its leaders were unable to provide for the basic needs of the islanders, and Easter Island's society disintegrated into chaos, first as famine set in, followed by civil war. By the 18th century, the population had dropped to between one-quarter and one-tenth of its peak. The islanders toppled the Moai during these clan wars, and by the first Europeans set foot on the island in 1722, only the barest vestiges of society survived. Although precise dates are impossible to pinpoint, due to the Rapa Nui's oral history and the dearth of survivors upon European arrival to the island, most archeologists surmise that conflict began around the 16th century and continued until the mid to late 17th. Easter Island, Pacific Ocean. 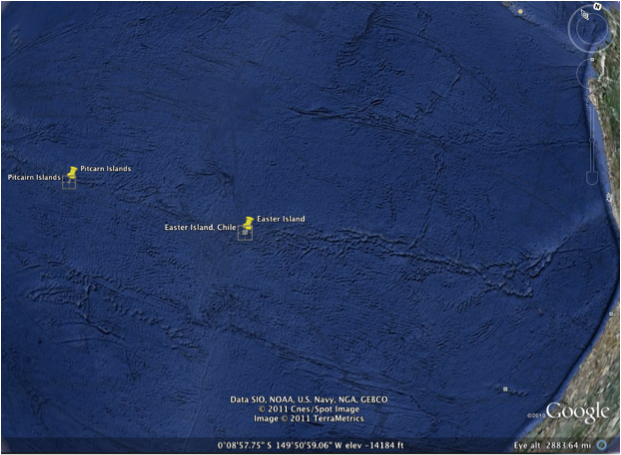 The closest populated landmass is Pitcairn Island 1,289 miles west, with a population of less than 100 inhabitants. 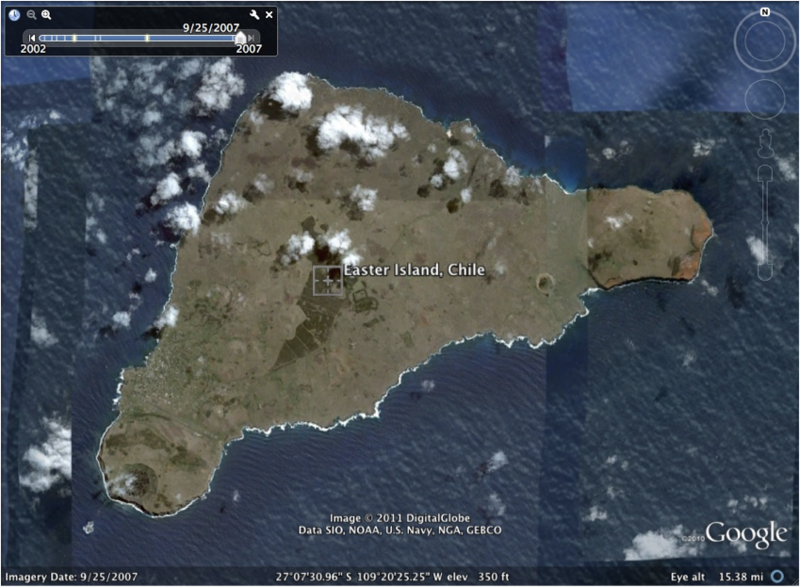 Easter Island is a territory of Chile as of the late 19th century, located 2,180 miles east. 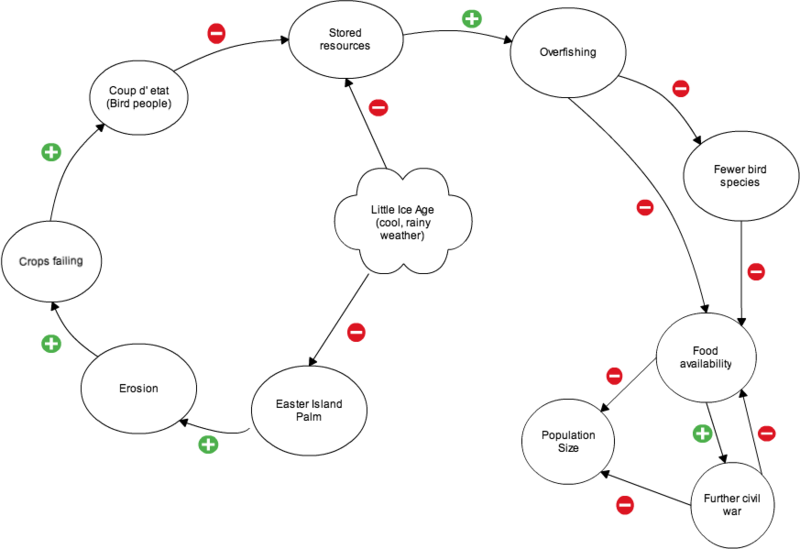 The island is extremely isolated, and an ecological system in and of itself. The people of Rapa Nui were as much victims of their own overexploitation of the island as they were participants in a bloody civil war. 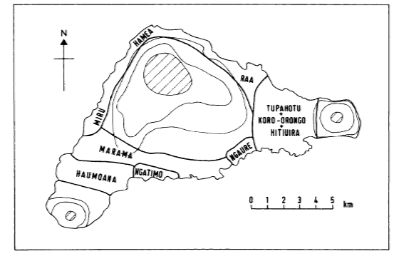 The approximately ten clans on the island eventually split into two groups, the Hotu-iti and Ko Tu‘u Aro, controlling the southeast and northwest parts of the island, respectively. These two groups engaged in increasingly intense competition which degraded into civil war. From the beginning of human settlement on the island until the end of the 13th century, agricultural practices were characterized by sustainable land use. 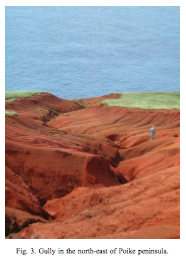 Soil erosion was not significant until the late 1200s, when much of the island experienced slash-and-burn clearing and intensive farming. Such practices caused heavy sheet erosion, because the soil no longer was held in place by natural vegetation. By AD 1400, agriculture ceased in areas such as the Poike Penninsula on the east side of the island, as the soils had completely eroded. Gullies bagan to form in the early 20th century, and formerly fertile soils have turned into badlands, a significant problem for present and future ecological conservation. Widespread species loss on the island was not restricted to the Easter Island palm. The isolated location of the island meant that endangered species had no way of seeking repite from the growing Rapa Nui population. The island once was home to over 25 species of seabirds, though 8 to 10 no longer breed there and 13 to 16 no longer breed on any of its offshore islets. Only one species remains today, Phaethon rubricauda. All six estimated land bird species are extinct. According to Dr. David Steadman, curator of the ornithology division at the Florida Museum of Natural History, Easter Island lost more of its indigenous species than any other island of its size in Oceana. Other lost species included the relatively more diminutive trees Sophora toromiro and Triumfetta, as well as the famous palm. 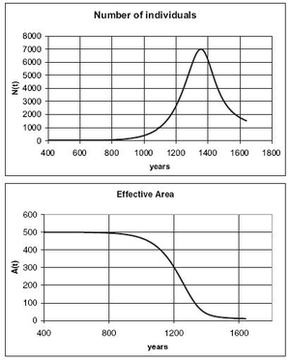 The Little Ice Age, occuring between approximately AD 1350-1800, saw a dramatic shift in the way both ecosystems and people survived. 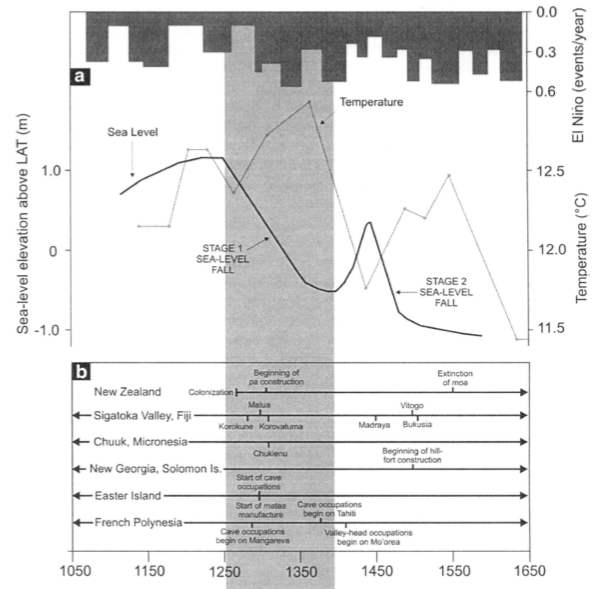 Animals and humans alike discovered that the cooler temperatures and drop in sea levels reduced the food available to consumption, often leading to conflict. The winds had shifted, and the island was no longer accessable to the Polynesians in their wooden boats. Archeological data indicate that cooler temperatures and dry condictions during this period led to more intensive agriculture on Easter Island. The islanders moved inland at the beginning of this period, consistent with the behavior of other Pacific Islander societies around this time. Inland living offered several advantages to residences on the coast in this kind of environment: as food was scarce, families could minimize effort and maximize output to reap adequate crops, in an environment more conducive to conflict over dwindling resources, alliance-building was more easily facilitated when neighbors lived a few steps away from each other, and clans could more easily fight their way up the social ladder. Large rectangular group houses were indicative of inland residences; this graph illustrates the number of such places in a part of Easter Island's souther interior. The AD 1300 even, or the main period of sea-level fall, is represented by the shaded gray bar. 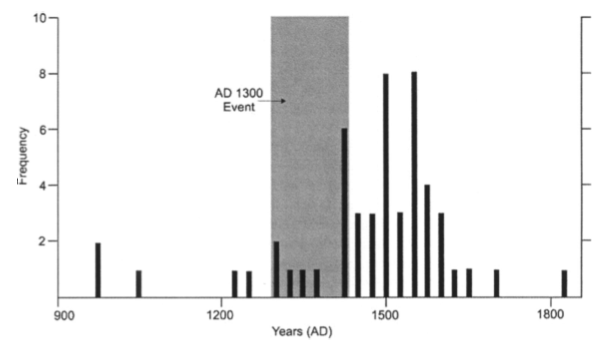 The beginning of the AD 1300 event coincides with the first burst of inland colonization, and by the end of the Event, the trend had caught on rapidly. Due to a combination of human factors and the change in climactic conditions, most of the woodland and plant life declined at this time. Around 1200, widespread slope wash began, consistent with increased rainfall, deforestation, and large swaths of land put to use for agricultural purposes. The Little Ice Age was a period of cold, rainy weather forcing the inhabitants of Easter Island to make major lifestyle changes in order to survive. These pressures led to group tensions, eventually erupting into violence. Civil-Clans fought amongst each other until surviving individuals were forced to resort to canibalism to stay alive. (a) High: The population of Easter Island fell precipitously from roughly 10,000 to less than 200 in a matter of decades on an island only 62.3 square kilometers in area, slightly under the size of the Federal District of Washington, D.C.
Local: At the time of the Easter Island self-destruction and civil war, it was completely isolated from all other populated land masses, due to the lack of any ocean-worthy materials. However, if the conflict occurred today, it would have regional, if not global impact. Although the loss of species and degredation of natural resources on the island would directly impact other populations, the implications of exhausting Easter Island's food supply extend well beyond the island's shores. The level of ecological destruction leading to a near-complete lack of resources and inter-tribe conflict would necessitate regional and perhaps global intervention. Yield: both parties fought until nearly the entire population of the island was killed; survivors allegedly resorted to canibalism. M. Bologna and Flores, J. C. (2008). A simple mathematical model of society collapse applied to Easter Island. EPL, 81, 48006. Jared Diamond. (Aug 1995). Easter's End. Discover Magazine. <http://discovermagazine.com/1995/aug/eastersend543>. Accessed 2 July 2011. Palm & Cycad Societies of Australia. Pascoa - Paschalococos disperta.< http://www.pacsoa.org.au/palms/Paschalococos/disperta.html>. Accessed 4 July 2011. Polynesian Cultural Center. Rapa Nui (Easter Island). < http://www.polynesia.com/rapa-nui/index.html>. Accessed 29 June 2011. David W. Steadman. (Feb 1995). 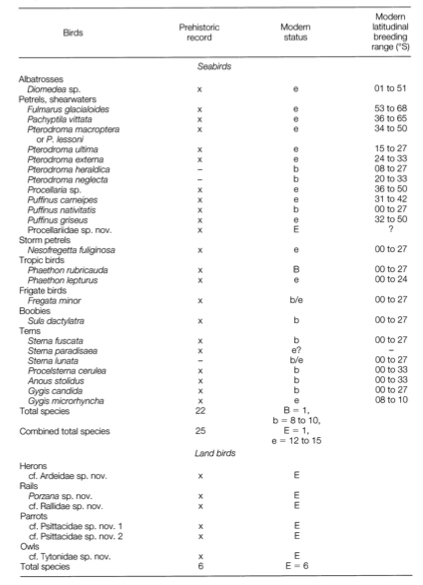 Prehistoric Extinctions of Pacific Island Birds: Biodiversity meets zooarchaelogy. Science. 267,1123-1130.